Google’s new announcement: Google displays tweets! Lovebirds Twitter and Google have paired up to let Google display tweets in Google search results on both desktop and mobile devices. This means that you can now access real time tweets using your desktop, phone or tablet. Google used NASA as an example. 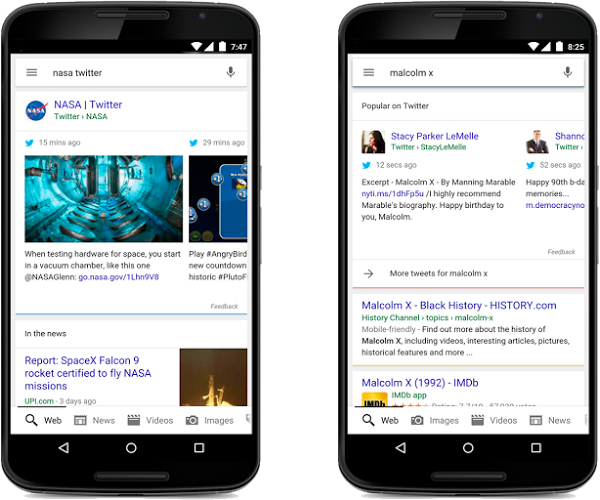 Search your Google app for “NASA Twitter”, and you’ll see tweets from @NASA in your search results (see the first mobile above). Google used another example. Say you know that it was someone’s birthday, but you couldn’t make it to the big party last night and you want to know how it went, who was there, what they wore, etc. Simply ask the Google app about it and see goss that the Twitter community is talking about (see the right-hand mobile image above). When you tap on the tweet search result, you will be directed to the space on Twitter which shows the actual Tweet and any additional content. To begin, Google and Twitter are launching this project on Google.com (in English) in the Google app (Android and iOS) and mobile browsers. This is a gradual rollout, to Google advise to stay tuned for your preferred language.